Although fishing and trade have always been carried out from here, the harbour as we know it today, in terms of size and shape, owes much to the crucial role that Bridlington Quay, the Bay and local people played in servicing and sheltering the thousands of ships which carried much of the country’s commerce along the North Sea coast in the age of sail. From the late sixteenth century vessels known as colliers voyaged down this coast from the rivers Tyne and Wear laden with cargoes of coal bound for London, the Low Countries and many other places. By the eighteenth century the seas off Bridlington Quay were teeming with maritime commerce. Merchant ships arriving from the Baltic often looked to make landfall off Flamborough Head. But the North Sea was a treacherous place for sailing ships when conditions deteriorated and Bridlington Bay was one of the few places on the east coast where sailing ships could find some sort of refuge. Flamborough Head formed a natural breakwater under which vessels could ride in relative safety in northerly and north-easterly gales and, although Bridlington Bay is open to the south and west, a considerable level of protection was provided by the Smithwick Sands. When north-easterly gales raged, fleets of more than 300 sailing vessels were commonly seen at anchor, sheltering just offshore, sometimes for weeks on end. Bridlington Quay sailors kept these ships well supplied with beef, bread, water and other vital commodities. This trade was extremely important and the Quay’s boatmen, many of whom were at one time licensed by Hull Trinity House, were renowned as accomplished pilots who possessed an in-depth knowledge of navigating the Yorkshire coast. Bridlington pilots often assisted sailing vessels, damaged or in distress, into the harbour for refuge and repairs. Local mariners were adept at refloating vessels driven ashore on surrounding coasts and guiding them into the harbour. 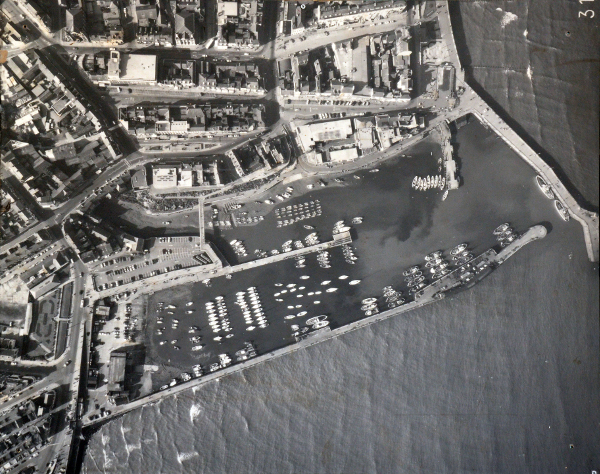 The port’s role as a place of shelter was officially recognised in 1697 when Parliament granted Bridlington Quay the status of harbour of refuge. The same parliamentary act also created the Bridlington Harbour Commissioners and gave them the right to collect them to levy passing tolls on colliers leaving the rivers Tyne and Wear. This money was used to improve the harbour and enhance its role as a place of refuge for ships in distress. Bridlington maintained this status well into the nineteenth century and one important reason the harbour is its present size has to do with the need to provide a large area of mooring for ships from the passing fleets requiring repairs and shelter. But even though Bridlington harbour and bay often provided some form of refuge, many vessels and their crews still succumbed to the North Sea’s treacherous weather. The worst disaster was the Great Gale of February 1871 when a storm of almost unprecedented ferocity broke upon ships sheltering in the bay. Many ships were driven ashore in the sleet and snow as the wind reached hurricane-like proportions. More than 30 ships were lost in the storm along with the lives of seventy seafarers including the crew of the local lifeboat.